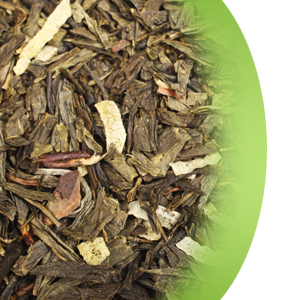 An all time best selling tea blend in our tea portfolio. This exceptional green tea, gained its popularity due to its intense, clean toasted coconut, that merges seamlessly with the finest quality green sencha tea. Unbelievable cup of tea, hot or iced. An all time best selling tea blend in our tea portfolio. This exceptional green tea, gained its popularity due to its intense, clean toasted coconut, that merges seamlessly with the finest quality green sencha tea. Unbelievable cup of tea, hot or iced. A simple must try.